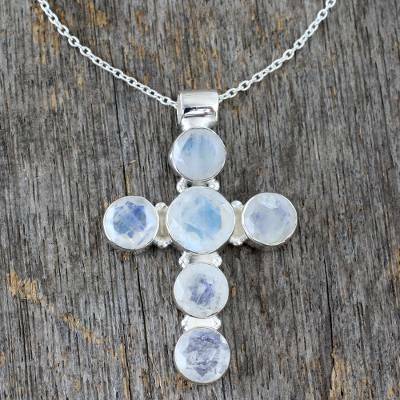 Rainbow Moonstone Necklace in Sterling Silver Cross Jewelry, "Cross of Peace"
Rainbow moonstone brings its subtle rainbow to a beautiful gemstone cross. By Mahavir, the pendant features stones set in silver and is worn on a sterling chain. Such a great reminder to count my blessings and enjoy every day! I love my cross!! So beautiful and my favorite stone!! Moonstone is so beautiful! !